Really love the template. Clean & simple. Easy to use. I got a little issue with my blog image & Pasquale manage to solved my problem. Thank you. I buy a lot of WP themes and I’ve learned a ton about diving it because typically theme authors aren’t a lot of help once they’ve made the sale but Siuy was amazing. Very easy to install! You just have to add the components you like and you'll have to create the jumbotron with the settings provided but it is not difficult to use at all! Image jumbotron & bold statement. Video parallax & Youtube support. Get mobile friendly; Siuy theme is fully responsive out of the box, no need to create anything separate for your user’s mobile experience. Displays search form in site navigation that makes users search the site quickly. Optionally remove the Siuy credit & add your own custom copyright message, including HTML. Toggle the visibility & reorder the homepage components or any function hooked by Siuy theme or Siuy Plus plugin. Create a fluid template which spans from right to left takes most of the screen's width. Siuy theme is fully compatible and tested with most popular WordPress plugin that supports the creation of multilingual layouts. For brief snippets of text that aren’t entirely whole blog posts, such as quick thoughts and anecdotes. Similar to a Facebook note update. An audio file of your tunes or podcasts. The first <audio/> tag or embed in the post content will be considered as a video post format. For those days when you just want to share a link to a fantastic article you read which creates a post that links to external resources right from the title. A quick update on what you are doing right now most likely to a Twitter status update because updates are no longer reserved for social networks. To highlight an interesting conversation or a chat transcript you have with friends, both on- and offline. You can use this option to choose a color, view color suggestions, refine with the color picker, & apply background color changes. Supports both the header image & video which gives you an option of uploading your own MP4 video, or linking to one hosted on YouTube. The components repeater field allows you to create a set of sub-components which can be repeated while editing content! You can reorder the components via drag and drop. A full-width widgetized region which will display any widget added to this region above the Siuy footer widget area. The free version of the Siuy theme gives you the perfect opportunity to try out the theme and design to see if it is the right choice for you before upgrading to the paid version. 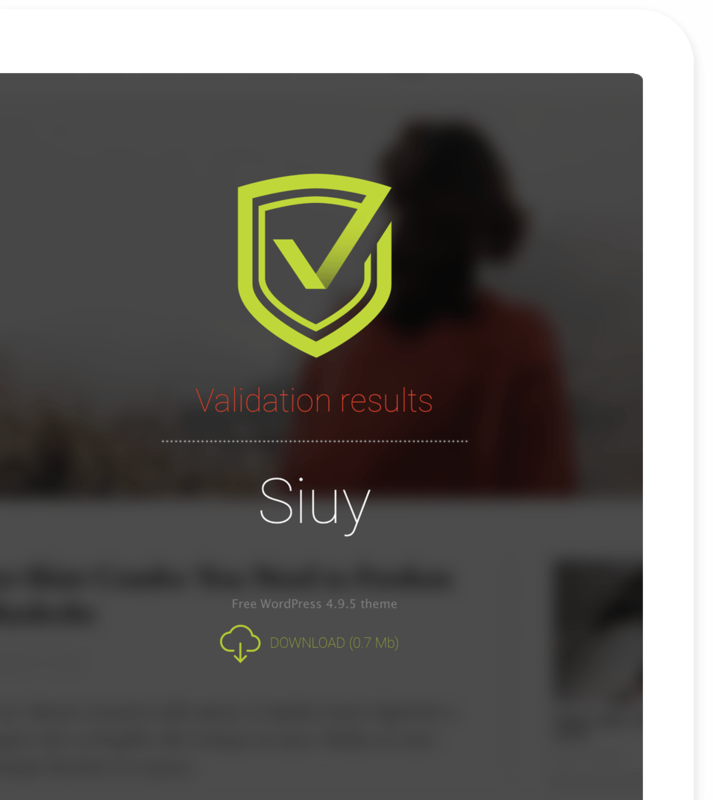 Siuy Plus is a WordPress plugin that extends the Siuy theme. All versions, files, & folders of Siuy theme analyzed by ThemeCheck.org which is a site that provides a validation service for WordPress themes with running tests to verify security and code quality. 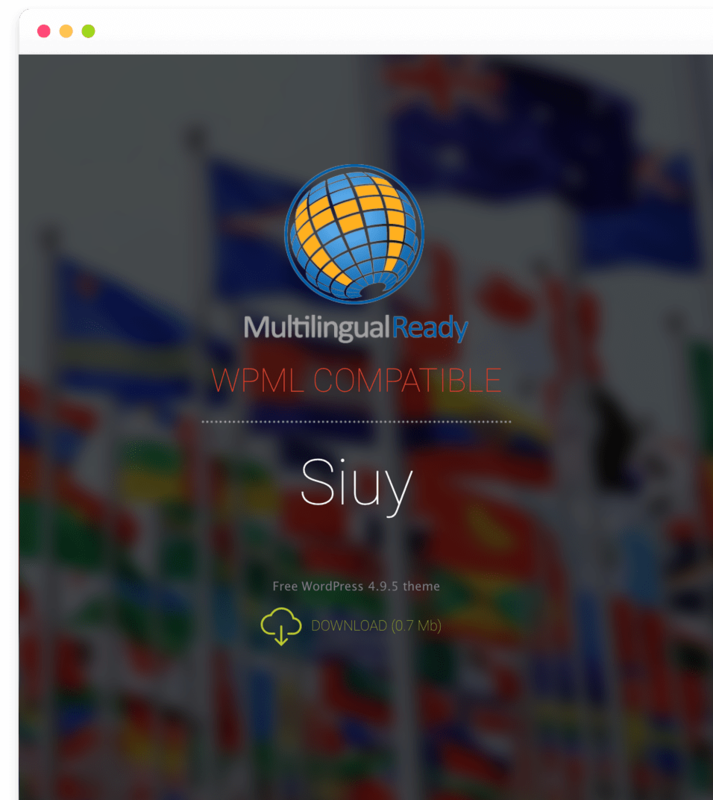 Siuy theme provides multilanguage support out of the box, & it is entirely compatible with most popular WordPress plugin (WPML) that supports the creation of multilingual layouts & pages.